Las Vegas is a place for those who like to work hard and play hard and there was definitely a lot of that but the most important part of the show were the big revelations that the post production giants like Avid and Adobe were making. Fortunately we were there to witness and speak to the professionals about it! 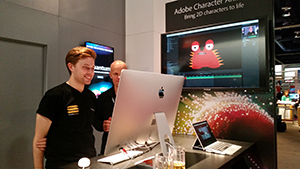 Adobe Systems is always going to be a game changer at the NAB and as usual it never ceases to amaze. Having guest speakers on the hour, it was jam packed continuously. This year they had many new features to talk about, from the Character Animator which originated from Project Animal to the Lumetri Colour which is the new panel which funnily enough is very similar to that of Adobe's design software; Lightroom. The Character Animator, which we spent a good few hours playing with, brings static image artwork from either Photoshop or Illustrator to life by capturing your performances using a camera and microphone. Your facial expressions are reproduced whilst the feature allows synchronisation with your mouth movements and also giving you total control over all elements of a character's movement through the keyboard, mouse and programmable behaviours. Whilst Adobe was releasing new updates, Avid made sure they kept up by announcing their free stripped down version of Avid Media Composer, this version will be Media Composer First. This come after they announced earlier on in the year the free version of Pro Tools First, again an easy to use beginners guide to the audio editing system used by thousands across the world. Other show highlights included Blackmagic's tiny RAW cinema camera. he miniature 16mm professional digital film camera with the brand new port that lets users use PWM and S.Bus Model airplane remote controls to work the camera wirelessly for capturing action anywhere and everywhere!The beauty of this camera is that it can be mounted on pretty much anything, it appears no other professional camera allows this amount of customisation in such a small body. The unique expansion port gives you unparalleled options for power, monitoring and remotely controlling the camera. This camera is available to purchase in July for $995. The RED exhibition was also a feature that caught the eye of many, showing off their own footage through the Occulus VR headset, a perfect way of promoting both companies through interaction. 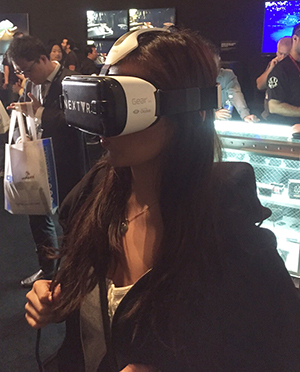 The EK team made sure they checked out the headset and were extremely impressed! Canon, the camera specialists and renowned for their fantastic quality, surprised us nonetheless when they delivered the goods at this years NAB. Yes it may set you back a whopping $16,000 BUT the specs are pretty incredible! 15 stops of dynamic range and up to 120fps recording, the 4K camera is most definitely going to be out of this world. Drones, drones drones! Seeing them, hearing them and everybody talking about them. 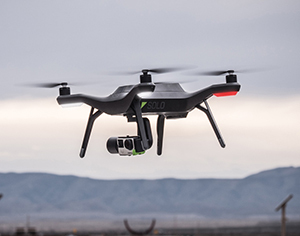 The drone was probably one of if not the star of this years NAB show. From the DJI Phantom 3 with it's two different levels of Advanced and Professional, the number one drone company was taking it to the next level with this new bad boy. Having the beauty of 4K built in to the Professional body of the DJI Phantom and the benefits of being able to control it from 1.2 miles away, this drone was the number 1 player. Claiming to be the first smart drone' in the world, the Solo Smart Drone , this particular drone was built to be used with GoPro and the features of being able to place your specific subject in the middle of a large environment. 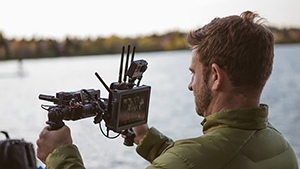 One big contender at this years NAB was that of the Freefly MIMIC. Allowing users to control MOVI movements from a different MIMIC Devices. For example your friend can be golding the MOVI device while you control the other. Some have said that this accessory could completely change the entire stabilisation industry if it turns out to have lowlatency. With a nice price of $495 it is definitely worth checking out! With Adobe and Avid announcing updates and revealing new things, it was Apple's turn to update the FCPX software, mainly focusing on the ability to create 3D objects directly in FCPX. Being able to create 3D text and basic objects in FCPX and adjust various parameters like lighting and texture. More updates to Motion were made, those being applied to its 3D interface. The DaVinci Resolve is set for a big update as they unveiled the DaVinci Resolve 12. With multicam editing and enhanced colour grading tools along with an updated user interface, the DaVinci Resolve 12 is noticeably better. So with what the team at Editors Keys believe were the best things to come out of the NAB this year, the above is just a snippet of some of the amazing things they witnessed. And is it worth the hype? Well if constant new gear isn't enough to tempt you, the atmosphere and people around will make it even more amazing than it actually is! Having professionals there to answer questions and give you more information on future revelations is really the icing on the cake! @editorskeys we'd love to hear your thoughts!